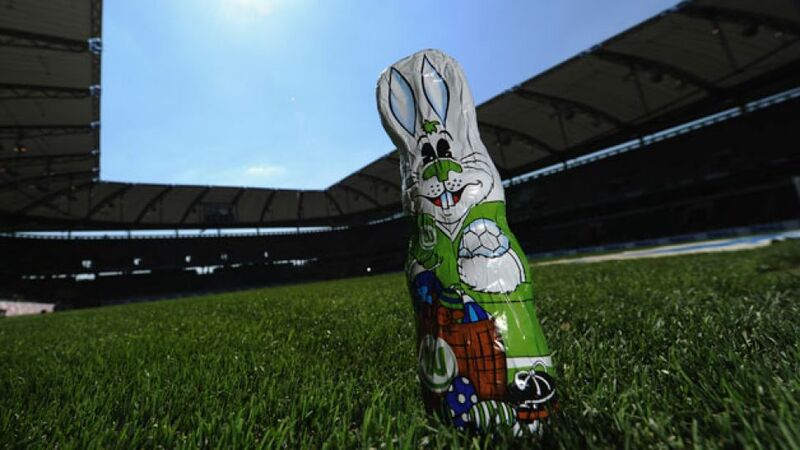 Munich - While Easter bunnies were busy delivering chocolate goodness around the world, the Bundesliga had a fair few treats of its own on Matchday 31. VfB Stuttgart boosted their chances of staying up on Sunday thanks to a 3-1 victory at home to third-placed FC Schalke 04 in the weekend's curtain closer. Bayer 04 Leverkusen reclaimed fourth place in Sunday's early game courtesy of a comprehensive 4-1 victory at struggling 1. FC Nürnberg. FC Bayern München left it late to beat Eintracht Braunschweig, but goals from Claudio Pizarro and Mario Mandzukic sealed a comfortable 2-0 win for Pep Guardiola's side. Borussia Dortmund clinched their place in next season's UEFA Champions League group stage with a 4-2 win over a plucky 1. FSV Mainz 05 at Signal Iduna Park. SC Freiburg took a huge step towards Bundesliga survival with a 4-2 win over Borussia Mönchengladbach. SV Werder Bremen came from behind to defeat 1899 Hoffenheim 3-1. FC Augsburg and Hertha Berlin played out a goalless draw at the SGL Arena. VfL Wolfsburg heaped the pressure on Hamburger SV after recording a comfortable 3-1 win at the Imtech Arena. Hannover 96 took a massive step towards safety after a 3-2 away win at Eintracht Frankfurt in Matchday's 31 opener on Thursday. That's all, folks! Make sure you join us later this week as we look ahead to Matchday 32 in the Bundesliga. Don't forget to follow Wednesday's UEFA Champions League semi-final first leg between FC Bayern München and Real Madrid CF at the Estadio Santiago Bernabeu on our LIVE ticker. , and finally, on Monday, he celebrates his 26th birthday. Many happy returns, Ibrahima! over Hamburger SV has lifted Dieter Hecking's men into fourth, but Bayer 04 Leverkusen only need to beat 1. FC Nürnberg to reclaim the sought-after UEFA Champions League play-off place. We say 'only': second-bottom Nürnberg are themselves pretty desperate for the points, too. That's all for tonight, but make sure to join us tomorrow as we look ahead to 1. FC Nürnberg vs. Bayer 04 Leverkusen and VfB Stuttgart vs. FC Schalke 04. As always, we'll bring you all the reaction from those matches as and when it comes in. Bis morgen! Champions Bayern don't plan on letting the absence of first-choice goalkeeper Manuel Neuer and Austrian international left-back David Alaba get in their way at Braunschweig. Full speed ahead! That concludes the first instalment of the weekend's live action. We will be back on Friday morning with more reaction from Thursday night's opener, and build up to the remainder of the weekend's games. See you then! Well the weekend is about to begin with Eintracht Frankfurt hosting Hannover, so head here for the ticker or read our match report at the final whistle!